Trumbo Electric is pleased to offer a full line of diagnostic and preventative maintenance services to our customers. 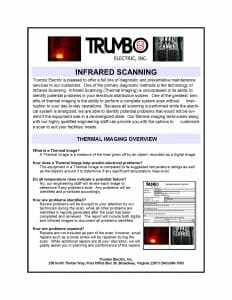 One of the primary diagnostic methods is the technology of Infrared Scanning. Infrared Scanning (Thermal Imaging) is unsurpassed in its ability to identify potential problems in your electrical distribution system. One of the greatest benefits of thermal imaging is the ability to perform a complete system scan without interruption to your day-to-day operations. 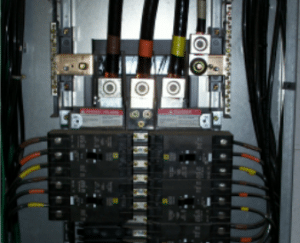 Because all scanning is performed while the electrical system is energized, we are able to identify potential problems that would not be evident if the equipment was in a de-energized state. Our thermal imaging technicians along with our highly qualified engineering staff can provide you with the options to customize a scan to suit your facilities’ needs. What is a Thermal Image? A Thermal Image is a measure of the heat given off by an object; recorded as a digital image. 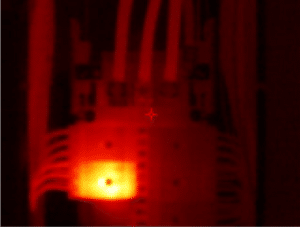 How does a Thermal Image help predict electrical problems? The equipment in a Thermal Image is compared to its suggested temperature ratings as well as the objects around it to determine if any significant temperature rises exist. Do all temperature rises indicate a potential failure? No, our engineering staff will review each image to determine if any problems exist. Any problems will be identified and prioritized accordingly. Severe problems will be brought to your attention by our technician during the scan, while all other problems are identified in reports generated after the scan has been completed and reviewed. The report will include both digital and infrared images to document all problems identified. Repairs are not included as part of the scan; however, small repairs such as a loose screw will be repaired during the scan. While additional repairs are at your discretion, we will gladly assist you in planning and performance of the repairs.